2014 Inaugural LegacyQuest Festival Entries Are In! *Here’s the blog we ran a while back announcing LegacyQuest, the International Children’s Film and Video Festival that will be held during AntiquityNOW Month in May 2014. 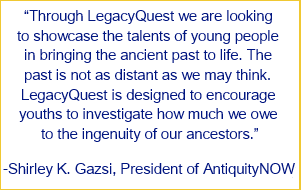 Please contact Shirley K. Gazsi, president of AntiquityNOW, at sgazsi@antiquitynow.org to discuss any ideas or if you have questions about an entry. We look forward to your submissions! Discovering the secrets of past lives can often defy conventional wisdom and astound our modern sensibilities. With this in mind, AntiquityNOW (AN) and Archaeological Legacy Institute (ALI) are launching the first LegacyQuest International Children’s Film and Video Festival open to young people between the ages of 12 and 15 (6th – 8th grades) in the United States and abroad. It will be held in conjunction with The Archaeology Channel (TAC) International Film and Video Festival, May 9-13, 2014, in Eugene, Oregon, USA.